Many homeowners these days are looking for a way to gather more people into their home. Whether it be the family that lives with them, the family that lives far away, or the friends that they call family. As we see this desire to have space to gather together go up, we’ve seen walls within homes coming down. 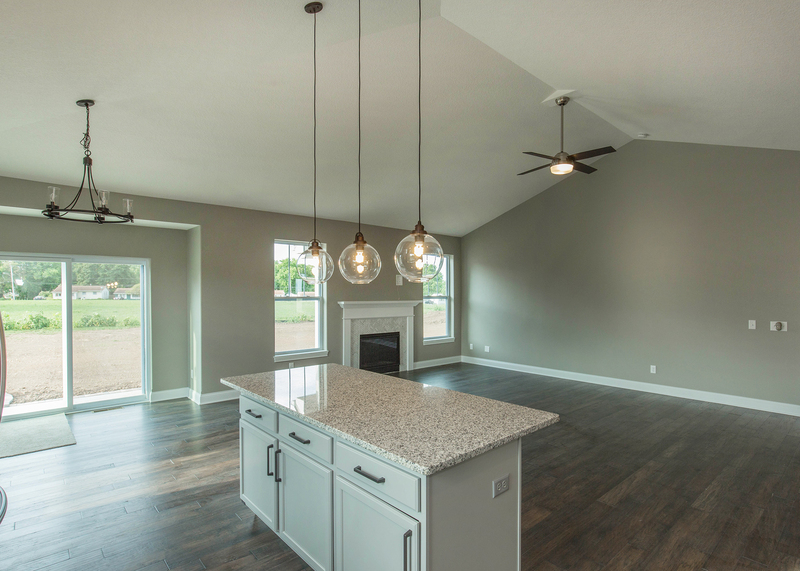 Open concept floor plans, where the great room, kitchen, and eating spaces all flow together, are increasing in popularity across all of our communities. These open spaces stimulate the senses and promote a more casual and connected environment. Our top ranch floor plan, the Bettendorf, is evidence of this. With the angled bar-height counter, eat-in space tucked into its own space, and open great room with vaulted ceilings, families find space to be together, while still feeling as though they have space to spread out. While many of us have seen houses use couches, rugs, and end tables as a way to create segmentation between rooms, consider how you can also make the furniture multi-functional across rooms. For example, placing the TV so it can be seen from multiple angles of the floor plan opens up seating when you’re gathering with friends to watch the big game. The kitchen performs many functions, it’s no longer a place to cook meals, but has now evolved into a gathering space. Often, the kitchen island becomes the heart of the gathering space as the cook is working to prepare a meal and others gather around to chat before dinner. Adding comfortable stools to the eat-in space at the island provides a comfortable place for conversation before, during, and after a meal, but also provides additional seating for guests. 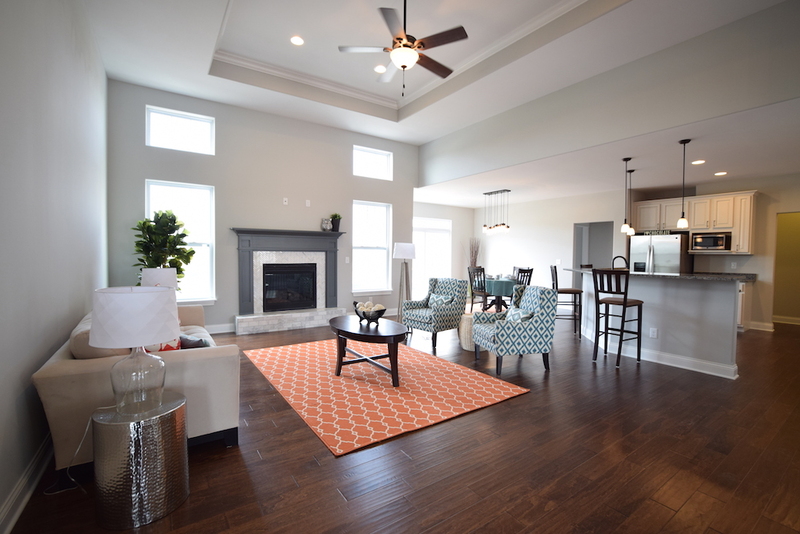 A vaulted or coffered ceiling can help to make your home feel more spacious, but you also run the risk of the home feeling too open and unwelcoming. 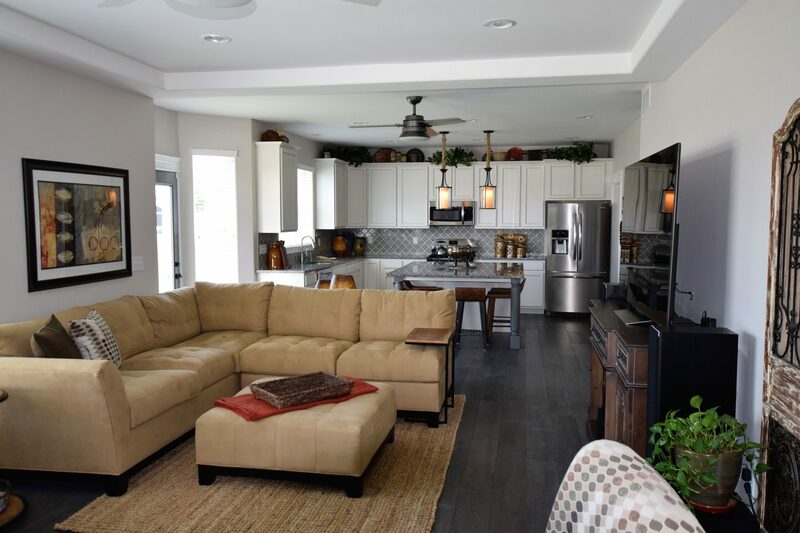 Hanging a large light fixture over the main seating area helps to bring the space “down” and provides a dual purpose of additional lighting and a great decorative piece. Open floor plans tend to have one color on the wall. Adding pops of color through artwork, blankets, pillows, and other decorative items can help to add interest to the different spaces. When deciding on the colors to add, pick a color palette for the larger space and then incorporate it into each of the smaller areas. Choose 2 or 3 complimentary colors and pull them into the spaces in the form of fabrics and accessories. A rough in the foyer with a similar color scheme as the pillows in the great room and kitchen linens can pull a seemingly open space together.